Work for Sprinklr Social and Messaging Suite? Learning about Sprinklr Social and Messaging Suite? "It's a good customer support tool." I think it is a well-organized tool. It is very suitable for customer support. And It is good to be able to provide customer support in real time. In addition, the ability to post ads for company products is also an advantage. Customer support results can be analyzed and satisfaction surveys can be conducted. Regardless of company network, it can be used easily from outside. It can also be used as a smartphone. A computer account can be linked to a smartphone account. You can review the content you have provided. I used a few tools to assist customers, but I think sprinklers are the best for customer support. Sometimes it hangs and an error occurs. In addition, in the case of facebook or twiter, it is impossible to delete the contents. Reporting on support results in real time is difficult. In many cases, the sprinkler does not come in. There are times when the case is not well distributed. An error may occur during the creation of the support content, which may require rewriting. Sometimes I log in but the status changes automatically. We are supporting the problem with the Dell computer. We will advertise for Dell model, and upload image that helps when Dell model problem occurs. Customer support hours can be analyzed and improved. We upload information about the Dell model and see how customers respond to it. "Sprinklr. Is. A. Beast. " "Feedback for Sprinklr's Display Module "
The Display UI is slow, laggy and sluggish to respond at times when creating/ editing/ displaying a storyboard. The storyboards take a lot of time to save/ publish. The Display is an amazing module to showcase listening/ engagement capabilities for your business. The ability to customize widgets/ charts using CSS and JSON code makes is so powerful to use it for your use case. I recommend this module to every business who are looking to adopt it. We use Display to showcase listening capabilities to our internal stakeholders. We demonstrate the level of details built in Sprinklr listening module. We realize the benefit of using Display as our business stakeholders (Product Design, Services, Marketing, Sales, HR etc.) now take social feedback as an important factor in decisions making. "Consolidation of all social tools in one space"
"Sprinklr is a powerful platform that is made for large teams"
""A decent client bolster apparatus."" The general format of Sprinklr Social and Messaging Suite is flawless and makes finding and arranging information simple. I like that we can redo the format to suit our inclinations. Makes the board of different social stages solidified and simpler to learn. Sprinklr has enabled our group to streamline movement crosswise over worldwide channels and organizations with resource the board, worldwide labeling structures, and predictable revealing. Since the framework is intended for explicit use cases, the vast majority of the inconvenience shooting, falls on the person who sees how the usefulness is being utilized. Sprinklr has incredible assets that can be utilized for Paid social advertising, natural social showcasing, and network the board - the stage is best utilized when every one of the individual groups is exploiting the stage capacities. 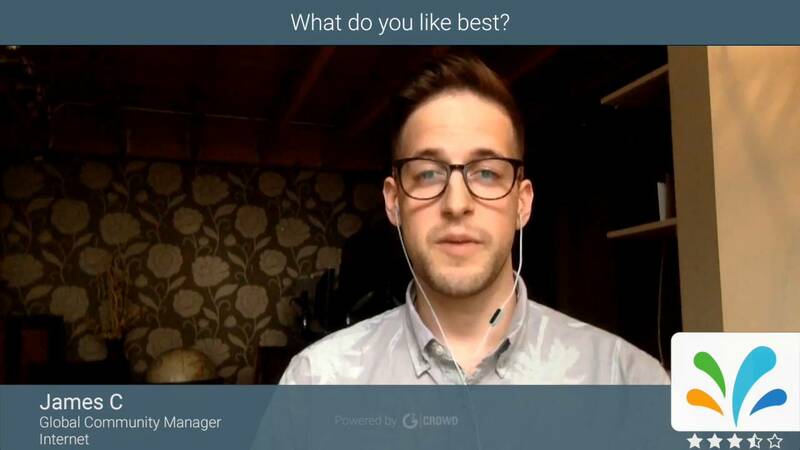 We utilized Sprinklr to survey execution over different campaigns, fabricate advertisements for Facebook and Instagram campaigns, and manufacture social listening questions to evaluate how individuals were responding to key minutes our business was related with. "Helps us stay closely connected to our contacts, leads and overall audience"
I really like its ability to publish to various social media platforms and track user activity and sentiment on those platforms. Viewing the data through the calendar helps to simplify our organization of the data. The tagging feature is great for organizing data into relevant groups and topics. The overall layout of Sprinklr Core is neat and makes finding and sorting data easy. I like that we can customize the layout to suit our preferences. Some of the data regarding sentiment doesn't always match up well with the raw data we see. Though working with the Sprinklr Core support team has generally been pleasant, there are times when it's hard to get a hold of them. The search feature for posts is a bit limited and doesn't allow us the complete control that I'd like to search for older posts. I think Sprinklr Core can be valuable for companies with a strong focus on social media engagement. It can allow you to process data more quickly and efficiently, which is especially handy when you're dealing with lots of posts and followers. When used thoughtfully, it can potentially improve sentiment for company and lead to higher conversions and customer satisfaction. It is also just a great organizational tool that can help you save time by scheduling posts to publish later. We have used Sprinklr Core to help publish social media posts and analyze the activity from all of our social media accounts, which include Facebook, Twitter and Pinterest. It helps us to quickly receive social media data and respond and react to the data in a timely, thoughtful and well-organized fashion. Social media is a key part of our reputation management today and Sprinklr Core helps to keep us in touch in a more streamlined and organized way. We have achieved greater user engagement and improved sentiment by using Sprinklr Core. "Sprinklr - A must for multi-social media posting"
if you're posting company branded posts on multiple social platforms then Sprinklr is a great fit for the service's versatility. However, if your company only uses one social platform then Hootsuite would be a better option. "Great tool to schedule posts "
I like that once I schedule posts.. let's say 3 posts a week, I can forget about them and the software posts them like clockwork. I don't like when I schedule a post for LinkedIn on a certain day and time and click the button on the bottom left to schedule another post (promoting the same post, but maybe using copy better suited to twitter), the software forgets the time/date of the previous posts and defaults to the current date/time. Sometimes I forget to manually correct this and end up with posts scheduled for different days. Would be good to be able to schedule posts for different channels in the same window. Adhoc social promotion... with Sprinklr I can put a designated strategy behind what I post/and when I post to see what day/time posts perform best on. And can plan accordingly. I can also monitor content and make sure it is engaging and not too much of the same. "A good tool with a lot of malfunctions"
The way it puts everything in one place - comments, messages, various platforms - Facebook, Twitter, Instagram. The ease of answering all the comments and questions in the same place. The archive for all the posts on a Facebook page. The ease of scheduling posts for a whole month in advance. I hope that I'll soon be able to use it for Instagram properly as well. Also, it would be great to access the library easily and find my own uploads there. The Search function for the Messenger only works for the messages received, but not for our responses too. The mobile Sprinklr for Instagram never functioned, even after I checked with the support team from Sprinklr if I do anything wrong (I wasn't). I couldn't add name or page tags in the posts. The photo/video library is a mess. I recently experienced more than 7 times a bug on my smartphone, where a message appeared (You cannot use Sprinklr on this device) and obviously couldn't use the app on my Android device, the one that I use since 2017. Patience with the bugs. I hope that I'll soon be able to use it for Instagram properly as well. Also, it would be great to access the library easily and find my own uploads there. I manage Microsoft Romania Facebook page and it would be a brilliant tool once all the bugs are fixed. I hope that I'll soon be able to use it for Instagram properly as well. Also, it would be great to access the library easily and find my own uploads there. Many customization options in the analytics section. Can manage multiple accounts over multiple platforms. User friendly, even for newbies. Many, useful options to share data with colleagues. It does not perform the same on different browsers, it works best on Chrome, i would have issues on firefox and IE. Give it a try, i havent work with any other took for at least 4 years since i am writing this. Sprinklr does everything i need in a quick and hassle free way. I show other colleagues this tool and its benefits whenever someone asks me, which tools do i use for analytics and monitoring. It has everything you need in one tool, you can login and monitor multiple social media sites on one screen, the reporting tools here are the best money can buy. I used to work at a place that did not provide a tool like sprinklr and work took at least triple the amount of time as everything had to be sorted out manually. Once everything is configured (which is done easily) All the metrics are available one click away. Another benefit is that it support not only multiple accounts, but multiple social media networks, one can simply work immensely with sprinklr. "A Bird´s Eye view of all your social media touchpoints"
The possibility to navigate the information, investigating from a macro view to the specific detail you need to know. Also, custom metrics make exporting to spreadsheets a thing of the past. You can work your data inside the platform. Heaving our customer service team onboard is allowing other areas from the company to create actionable content for social media and mitigate crisis in a much faster and centralized work. The implementation and operation teams work closely to us in order to have a very precise setup, and customer service is always available. Also, you have the means to create reports, workflows and apply automation to a wide range of processes that otherwise would require a lot of manual work, such as integrating informations from multiple networks, categorize content and prioritize our client´s needs. We replaced 3 other social media tools for Sprinklr, with major improvements. There should be better integration between the modules. It is imposible (at this moment) to merge information from Paid Media and Social Core or other modules. Also, metrics and tags/classifications should be unified across the modules. You can tag all your work in Social Core or Care modules, and the Paid module have no idea of the detailed information you added. The overall cost is very expensive for the tools themselves, and for most of them there is also a per user cost that can limit the usage depending on your team size. Consider the integrations beforehand. Automate everything you possibly can, including tagging contents based on specific keywords and hashtags. Use the custom metrics to avoid needing to work the data off platform. We now have an overview of everything that happens inside our networks, and a view of the market. We are hoping to implement the approbation and posting workflows very soon, so we can better create, manage and analyse the content we produce. The responding of interactions in the channel of my clients. its very easy to interact and reply the comments we received in the channels. its very usefull to programming the posts on the weekends. I have problems to published intagram videos e photoalbuns. sprinklr doesnt let us published videos and photoalbuns directed there. we have to use our own cellphones to post the content. Collected comments from darkposts on instagram. its too much better to categorized the comments when we have make the responding of the comments. Collected comments from darkposts on instagram. its too much better to categorized the comments when we have make the responding of the comments principally on the instagram. "There is still room for improvement"
I very much hope that the new version of UI is intuitive, simple, convenient and fast.I can see more directly the information sent by users, and communicate with users more efficiently.I can also see whether there are messages during the non working hours, so that I can follow up the users' questions.Search cases have also become more convenient,make our work more efficient. Its growth is obvious to all. We see that it is constantly improving itself.But there is still room for improvement. When users click on online support, our list will not automatically display information, which will lead us to ignore the user's request, will be mistaken for us to ignore the user, hope that this point It can be improved as soon as possible, thank you. I think the function of adding pictures can be strengthened. I hope we can add more than one picture at a time. It will be more convenient and faster. You can add a single number of pictures, but do not add one. I hope it can get better and better. I can quickly find my case and help me better follow up customer problems.It is faster and more convenient to switch between different cases.Prompted information can help me understand the update status of the case.Tool optimization is a very important part of our work, and good tools can make our work more efficient. "All-in-one Social Media Insight Gear"
Aggregation of all channels and KPI's, and cascaded breakdown visual reports on "Campaign" or "Content" level. Unifying cross platform Engagements at glance. Support of the Paid Ads reports, to provide Performance checking. Flexibility on the time filters, and accurate "Time Zone" based reports. Schedule a Post in different formats for different platforms, post it as scheduled. defining personalized gadget is a bit complex. Lack of support on the "Telegram" which is our countries major communication channel. Lack of support on Video View Rates in Instagram. Not easy to separate the Story, and actual post engagements on the Instagram. the mobile app is not friendly on the dashboard checking. Sometimes the Account connections are disconnected, and the KPI's are missed during that time. Recent upgrade on the "Space" environment, is a bit hard on the UI usage while it seems to be heavy for the browser processing power. Perfect tool, with support of almost all main social media channels. Main benefit: aggregating all the Channels and KPI in one suit, saving a lot of effort and time on merging cross platform report. With Sprinklr you can get insight, of Total Social Media Status at a glance. Cross platform Social campaign results are now easily aggregated. I like that it is great for managing multiple accounts from multiple stakeholders, and it's designed to serve a multi-layered organization. Everything else. The team at Sprinklr has made my experience with the tool at 2 companies complete garbage. The team is not knowledgeable and not only do they make little effort to assist, they also don't find solutions. It feels constantly like the Sprinklr team isn't paid enough and they're all terrible at client services. I cannot recommend them less. The people I've worked with at Sprinklr never know what they're talking about and cannot solve client troubles. Do not consider Sprinklr. Use the native tools because the Sprinklr team will not serve you. Go with Opal? Integrated tools and techniques to structure and synthesize the data, Natural Language Processing capabilities, search size, simple to use methodology to setup listening. Easy to engage with customers across multiple platforms through a single tool, engagement metrics, real-time monitoring, ease of access, reviewing conversations and keyword highlight features. Well planned and executed platform updates and enhancements. Overall good performance and reliability. Sentiment Analysis, User Interface, Time to Resolve can improve. Ability to evaluate the reach or impressions on web pages and domains. Ability to block span generated through bots and domains. Social Media Analytics through Sprinklr helps deliver insights that enable businesses to drive improvements in Product Quality & Customer Experience. Listening allows to identify and assess sensitive conversations on social media and act real-time, now that social being the prominent channel for customers to share their experiences with a brand, their service and products. Publish proactive content in the form of self-help material for a wide range of issues and educational topics. Makes management of multiple social platforms consolidated and easier to learn. If you're new to running social ads, this helps eliminate some of the barriers to entry. It's also good for budget management and making many changes in bulk. Customizable columns are helpful, and having the change history on record is useful. It saves time only having to log into one platform on Sprinklr instead of multiple platforms throughout the day. Not all features available natively are in Sprinklr. There are occasionally errors that occur and do not have very thorough explanations or solutions in the UI. Support is available, but they usually time a bit of time to follow up with a solution, and don't always have a solution. It's frustrating that performance isn't as easy to see outside of the reports section, and I'd like there to be a "total" row for all campaigns i'm viewing, especially when across multiple engines. This helps our agency run paid social ads for our client, while ensuring that security and privacy are still in place for them. The client gets to opportunity to keep control of their budgets and ad spend, and it also requires their approval for publishing new ads, ensuring brand guidelines are followed. QA is something that's very import to the client the extra approval step makes sure they get to review anything and request changes before ads go live and start spending. It was easier to use that other programs we have used previously. There are so many options that the system gives you and your customers. It seem like with the display world, there is so much more that technology allows us to do. I think more simple features would be better. The learning curve can be difficult and the fact that some deep coding is need can limit companies. Learn the system well and try to get a full understanding of it's features. There is so much more than meets the eye and you can do many things with this program. There are so many options that the system gives you and your customers. The coding aspect is huge and allows for so many more options when using the display. I think the direction the features head in can really allow for more uses over time. The platform is easy to navigate and it's easy to create groups and post to a multitude of accounts at once. Scheduling posts out is simple and I love that you can sample what your post is going to look like on different screens. Limiting calendar view gets tricky and glitchy. In working with as large of an organization as I do with several different account holders, I wish you could limit who can see which accounts. Our team is seeing all dental practices instead of just the ones they support which gets a little tricky. "Sprinklr Core Use for Social Media Publishing"
The planner view. I like the ability of viewing what I have staged on each platform for each day, with the ease of seeing if there are any "holes" in our posting schedule. Sometimes, though it hasn't happened in about a month or so, there seems to be a "miscommunication"/"translation error" between Sprinklr and Facebook. Some of our Facebook videos, particularly if they were added through the planner and not the SAM, have uploaded as 360 videos when they shouldn't have. We're working on expanding our reach, particularly to younger audiences (as a broadcast television series, our mean audience age is older). Sprinklr core analytics helps us realize which strategies are effective and which are not. "Awesome one-stop shop for social analytics"
A little hard to integrate with other third party capabilities like Bazaarvoice for Ratings & Reviews. We need easier ways to respond to R&R as well as consumer analytics coming from their platform to give us a 360 view of our consumer sentiment. Awesome product. They need to improve a little bit their openness to integrate with other tools in our company but overall, great product and service. Make sure you do a proper mapping and matching with all your existing capabilities and platforms, and get commitment beforehand to properly integrate. Otherwise, customizations later will be considerable. Understand our consumer sentiment, great visualizations and reporting capabilities. It helps us connect all the interaction points with our consumers, saving us time from having to access different platforms, vendors and some times disconnected metrics. "My Sprinklr Experience - Fantastic!" I enjoy the simple design and interface of Sprinklr, and that you can view messages as if using a messaging service so it flows like a conversation. With Sprinklr Space being quite new, there are still a few glitches that need ironing out. Sometimes messages close when you're halfway through typing, and it would be handy to be able to multi select messages when you're assigning them to the same case. Customers get responded to much quicker due to the simplicity and layout of Sprinklr, and the fact that all messages get filtered into one place. They are assigned fairly, and on the whole, pulled through in a timely manner. "THE Solution for Streamlining Social Efforts "
Sprinklr Core has allowed our team to streamline activity across global channels and agencies with asset management, global tagging structures, and consistent reporting. Being able to report out on KPIs globally has proven to be a true value to the business. The only area of Sprinklr Core that I think needs some work is the Mobile App. Although the new updates and interface are nice, I find that it is quite slow - especially in areas like listening, asset manager, and reporting. My biggest recommendation to others considering Sprinklr Core is to make sure that you sign up for the Advanced Admin and Reporting Trainings. After the trainings both myself and my coworker felt much more comfortable within the platform and really had a better understanding of the inner workings of the tool. Beyond streamlining our global efforts and facilitating engagement with our fans, we have been able to monitor and resolve any potential crises and report out on our performance to the business at large. "Great for scheduling posts, but could use a few tweaks "
I love how easy it is for me to schedule posts across platforms then have a calendar where I can review my social media plan for the week. I also love all the different reporting tools and how I can create a custom dashboard for my various social media accounts. Publishing video to social media platforms is still tricky and I find myself still going in by hand to publish directly through Instagram most of the time. Interacting with our social media audience is still easier directly on the platform, I wish it was easier and cleaner to do this via Sprinklr. I actually like having my social media inboxes separated out instead of all in one column. Certainly great for managing multiple social media accounts and for having clear reporting and feedback tools. We certainly are able to be more consistent with publishing and have built a stronger social media presence thanks to Sprinklr. It is also easier to collaborate with team members and justify and target our social media via reporting and feedback. I really like how you can customize the way the work flow can be done in Sprinklr. I really like the case management those most. It truly cuts down in the time we need to sort and moderate our customers. Sprinklr can operate a little show at times. The delays can confuse a user on if they had click on something or not. The other issue is when I have to report a ticket, sometimes I feel like it takes too long for a solution to be resolved. Or when we’re asked to record our screen. It just takes up more time that we’ve already lost when something is broken. Create an organized process that works for case management. Sprinklr helps as solve the SLA on reaching our customers in an organized and timely fashion. The way the reporting can be super effective and precise. Some times, we need to classificate our posts, so we can mesuare how much posts we have, and some times, sprinklr don't let us post the internal tag. make sure your support attend every question when we need to change the internals tags, since is super useful when you use sprinklr in a global way. Sprinklr give access to a lot of people without localizate them . As publishing, the best part is the reporting. Setting a profile for each customer with his data so it can be used in later campaigns. I realized speedy action to solve the issue with follow up too. "The best social media management tool"
"Sprinklr lacking in comparison to competition"
It has potential for large companies managing a multitude of brands, but for any company managing less than ten brands it doesn't provide much value. The dashboards are broken out into too small of fractured pieces and monitoring can't be filtered as smooth as other social media management platforms. The customer support is almost nonexistent and unless you mark something as on fire the responses can take weeks. Also, onboarding is nonexistent and you are left to filter through unhelpful documents rather than walk through setup. Take a hard look at your company and see if you are big enough to truly need a platform like sprinklr. There are platforms that are incredibly user friendly and provide amazing support that make social media management and customer service through a platform much easier. Nothing beyond scheduling and basic reporting. I think the calendar work plan is cleaner, but its harder to distinguish the times and dates and scroll through, I may have to spend more time playing with it but I wish it was easier to see a whole day of posts in one frame. Sprinklr Social engagement and publishing allows a company to run multiple campaigns and fulfill different content buckets in a clear format, that in the end allows to look deeper analytically than the native social platform can offer. "Robust and feature rich but complicated"
Sprinklr gives us the ability to scale our social program for the future. There isn't any question about whether or not the software can meet our needs now and in the future. The software is incredibly complex and complicated. Sprinklr has a serious lack of support, training and documents available to help navigate the software. The initial enablement is great but the problem is that they ask a ton of questions at the start on how you want your instance set up (and charge you like $15k for this enablement service) but if you've never used the software before, it is difficult to imagine how your team will best utilize. I have spoken with social managers of large companies say that if you begin using the software and it isn't 100% correct at the beginning with your tagging structure/reporting etc, that in order to fix it, you would need to start from scratch. Just watch what you are doing at the beginning and ask a lot of questions to make sure its set up perfectly for your needs. If you don't, you are on your own. Sprinklr allows us to have control over the social flow of information into the company. As I mentioned, it is a very robust platform with multiple applications- if you are using it correctly. "At first it might seem to be complicated, but late it's going to be your home!" I like how user friendly Sprinklr is, It's very reliable and you can really have every single detailed detailed prepared for you and ready to report, sometimes already in the form of a report. The amazing way of monitoring the queues and the agents numbers, performance and adherence is really wonderful! Sometimes while opening a public twitter contact it becomes so difficult to filter the tweets and figure out the main sender's tweets. The best part of Sprinklr is the layout of the UI. Very organised and easy to navigate. The automatic refresh and notifications make Sprinklr easy to keep track of while in the background. It would make it a little better if there were a feature to be able to mark/track a case that you may need to update or follow up on later. It's inconvenient to need to dig all the way through your previous messages in order to find a case that you need to chase up. Spend a few moments to grasp the layout and features, you'll be flying through it within minutes. Sprinklr makes the workflow and processes so much easier to handle, everything is in front of you in terms of adding the necessary Macros and properties to a case. "A good combination of social media planning and listening tool"
It is a good option if you want a comprehensive tool that gives you (in just one platform): social media capabilities, performance and analytics overview of your network and online listening resources. The social media and the report interfaces are very easy to use and offer a lot of filters and features to set up and analyze your campaigns. As I said, it is a good option if you want an all-in-one tool, but there are better individual alternative tools (for social media planning and online conversation listening). There are some posting limitations and listening features (mostly data presentation and options) that are kind of basic. Still I think it is a very reasonable option. "Completely customizable suite for social"
I love the flexibility Sprinklr gives me at every step of the monitoring process. By letting the user set tags and define criteria for every post you can keep track of your social activity in a way that makes sense for you. The monitoring dashboard can also be tweaked to each user's needs. This is a huge asset in reporting and cuts down on time. Some functionalities that are availble when posting natively don't make their way onto Sprinklr. There are few out there, so it's not a huge issue. Centralized asset management has never been easy! As a MNC it's great to be able to share all assets instantly with SM managers around the world and have them be organized. The new interface of Sprinklr space allows for a comfortable navigation across dashboards. They have also introduced in system tabs which allows multiple tabs to be open in one web tab. Sprinklr allows us to gather key customer insight through the detailed reporting tool. This allows us to listen to the voice of the customer and keep on top of common trends. The fact that the support team are real people you can have a friendly and understanding chat with about the issues/questions you've encountered with the product. The one thing I would prefer to have is a live chat feature vs. email support. You often get a few emails after submitting a support ticket and it can be hard to keep up with. I personally prefer chatting live because my inbox can get a bit chaotic and I can have a hard time responding to the support team over email. I was just encountering a weird pre-set within a social monitoring dashboard and wanted to reach out to Sprinklr Core to see if there was a simple way of resolving it. "Powerful if somewhat intimidating interface. Take the tutorials." "I use the reporting section for analytics and social listening on a daily basis "
The UI is pretty clean and easy to understand. It's very helpful to large companies who manage multiple brands. It's great for permissioning and restricting/allowing access to certain users/groups. I like that Sprinklr has access to most all networks. The support system is not the best - you do not get very clear answers from support techs and often times they just say, "nope, that's the way it is" -- it doesn't really feel like they are investigating the issue nor really want to get to root of our problem(s). Secondly, data purity. The data in reporting never matches native analytics and while I understand it will never match exactly, it is very off. So off that we don't trust it. As mentioned above, it's great that we have access to all these networks but when the data integrity is questioned, we can't really use it. How much do you care about data being accurate? If it's not that big of a concern, go with Sprinklr. If it's a big deal for you, find another solution. Content optimization. Cross-channel successes and failures. Are we meeting our benchmarks? Do we need to reset and evaluate based on performance. I work with always on measurement and reporting back to leadership the lay of the land and/or action items on how we intend to improve. "Robust Platform, But Not the Most User-Friendly"
Ability to control hundreds of accounts quickly and easily, and ability to schedule posts to all accounts at once. The interface is not the most user-friendly. You can customize views which is a plus, but until you do that it can be tricky finding everything you need. We post monthly updates to over 170 individual pages for each office in our company. We also need a way to monitor what each office posts and Sprinklr solves both these needs. First of all, I should say upfront that my role as Community Manager has me managing moderation only. My team and I do not handle marketing or listening, so my review is strictly from a Customer Care & Moderation perspective. I love how flexible and customizable Sprinklr is. As my team and I have identified needed modifications to rules, queues, and macros, it's been unbelievably easy to make those changes. The platform is so flexible that even if I can't figure out how to modify the settings how I want, our Success Manager can usually help us get there. Very rarely (so far) have we come up empty-handed and needed to come up with an alternative solution. From a management standpoint, Sprinklr's reporting options are incredible. Our previous platform (Expion) required that we reach out to our account rep for any reporting dashboards we wanted or needed. From there, it could take literally weeks for them to complete building them, and aside from basic filters, I couldn't change anything with the data. In contrast, Sprinklr allows me to create my own reporting dashboards that can look at macro usage counts to average handle time by user/moderator, and more. I can make and modify dashboards at will. I can schedule exports to remove the extra work of opening and manually exporting them. The dashboards have a whole host of visualization options. You can take the more left-brained approach (tables with a bunch of text) or the more right-brained option (lots of visual graphs and charts). I can't tell you how much I've loved having such a dynamic set of reporting tools and options. Support and stability are huge frustrations. First, let me talk about support. So the downside to Sprinklr's customization capabilities is that it's very challenging to get support. They have a great Knowledge Portal with a massive FAQ database, but it's all very high level and general. So if your organization has a lot of specialized or customized rules, queues, etc..., then good luck finding an FAQ that gets specific enough to help. Their customer community (forum) is either under-utilized by clients or clients do not bother to reply to other clients' posts/questions (perhaps, again, because of the specificity of different set-ups and customizations). That said, Sprinklr employees commented on one of my posts with very helpful information and even modified an FAQ on the spot to include information it hadn't before that. But worst of all, their ticketing system is a nightmare. To start, they demand so much information that it's really discouraging to even create a ticket. Even then, they nearly always ask for more details, and sometimes it feels as though they don't even read the details you give them. Because of the instabilities we've experienced (read on for more on that....), we've reported a lot of tickets. Most of the issues resolve themselves after a few days or a week, and the ticket gets closed without any real troubleshooting or feedback from support. At one point, they started demanding VIDEOS of issues because they couldn't reproduce. So we started including videos by default, but their support staff still asks questions of us that are answered either in the ticket description or the screenshots they demand or the video they started demanding. It feels a lot like their approach is, "Keep asking questions until the glitch sorts itself out," which is not a good support tactic. About half the tickets we've opened, I resolved myself after troubleshooting ALONE for well over a week. As for Sprinklr's stability, it's spotty at best. We've had a lot of random, oddball issues that support never really acknowledges or resolves but that seem to resolve themselves. Macros failing, moderator accounts going unavailable while they're actively working in the platform, filters not working, rules breaking, etc... Since we implemented in late April (almost 3 months to the day), there hasn't been a single week that's gone by without us opening at least 1 (and usually 2 or 3) tickets. It's been a nonstop battle trying to get the system to work smoothly and consistently, and since most of our tickets get closed without any real troubleshooting or resolution, problems pop up repeatedly. But support can't reproduce, soooo...."let us know if it happens again!" So you can wait a week and close the ticket again? Why bother? I mean, I still bother because I'd rather open tickets and get no resolution than to not even try. But, yeah. As much as Sprinklr has improved all the work we do, it's also been a massive frustration. Expion was nowhere near as good for moderation in general, but their support was responsive and resolution-oriented. If I could have Sprinklr's functionality with Expion's support, I'd be in heaven. But for now, I honestly wish I still had Expion. I can work around limited function, but limited support is almost impossible to suffer through. Be mindful of your business needs. Demand education on setting up and modifying rules, queues, & macros. You may even want to request to be part of the process when your implementation manager starts building your client environments. Because Sprinklr is live, it works really well for a team like mine with lots of moderators working simultaneously. No more worrying about people stepping on others' work items or accidental double-responses. Again, reporting is so much better now, so I'm better able to keep track of productivity and do quick spot-checks on quality. * We monitor all Sprinklr Social and Messaging Suite reviews to prevent fraudulent reviews and keep review quality high. We do not post reviews by company employees or direct competitors. Validated reviews require the user to submit a screenshot of the product containing their user ID, in order to verify a user is an actual user of the product. Hi there! Are you looking to implement a solution like Sprinklr Social and Messaging Suite?